In the fog of the 2016 presidential elections, the US appears to be abandoning 70 years of support for international economic integration. Whether due to a bout of populism, the trauma of the recent economic crisis, or the amplified reach of anti-trade lobbies through social networks, immigration and trade have become prominent political targets. The debate has also taken a toll on the prospects of the Trans-Pacific Partnership (TPP) agreement, inopportunely concluded at this politically charged moment (Menon 2015). More constructively, the debate has raised legitimate concerns about how TPP would affect vulnerable groups. We explore this issue by collecting results from recent work on TPP by us and other researchers. Much of this work is based on a global computable general equilibrium (CGE) model1 that incorporates new trade theoretic features, including monopolistic competition and productivity-heterogeneous firms, extensive detail on trade barriers and trade agreements, and on linkages between them. Disproportionately benefit poor countries and labour within them. Employment effects are prominent in the TPP debate, even though economists do not usually expect trade policy to change employment levels significantly (Krugman 1993). Rather, trade agreements both add high-productivity jobs in export-related firms and eliminate low-productivity jobs in import-competing firms. However, supporters of the agreement often claim employment gains, while those opposed expect unemployment. Our results project no significant general employment effects. In the long run, we assume that employment converges to normal trends with or without the TPP agreement. In the short run, macroeconomic shocks are of course possible, but the results suggest that significant US shocks via trade policy are unlikely. At the same time, they indicate that some workers will have to change jobs during the implementation of the agreement, and some may suffer unemployment and other significant adjustment costs. These costs have an important bearing on policy and will be discussed below. Since trade agreements are implemented gradually—many changes under TPP will take ten years, and some as long as 30 years—our analysis is mainly conducted in a long-term modelling framework. In the long run, if the economy’s normal adjustment processes work, shocks encountered during implementation will fade away and employment and savings (which determine trade balances) will converge to fundamental trends. Critics have argued, however, that mechanisms that may have once restored equilibrium are no longer working in the aftermath of the financial crisis (Baker 2016). That view is not supported by data (from the Federal Reserve Bank of St. Louis). Since the exceptionally severe shocks of 2008, the US economy has recovered steadily and has now added 13 million jobs, reaching levels exceeding pre-crisis years. The unemployment rate and a broader variant (U6) that includes part-time and discouraged workers are again at or near levels in pre-crisis, non-recession years. Macroeconomic shocks due to TPP could generate employment effects in the short run, along the implementation path. For example, if changes in exports and imports failed to offset each other along a segment of the path, they would generate net positive or negative shocks in aggregate demand. But the scale of such effects is likely to be very small in the US. Exports and imports are projected to change by 9% each by 2030, or about 1.3% of GDP. If these changes occur gradually, they would imply annual changes of around 0.1% of GDP. Even these small export and import changes will tend to be balanced by policy design and by exchange rate and other equilibrating forces. Remaining net imbalances are not likely to have perceptible demand effects. Although general employment effects are unlikely in either the long or short run, structural changes due to the TPP will imply adjustment and transitional unemployment. Research warns that these adjustments can weigh heavily on some workers (Autor et al. 2014). We estimate that the number of jobs affected—in the sense of jobs lost in import-impacted industries and gained in export-impacted industries—could range from 18,900 to 160,700 jobs per year, depending on assumptions about how far structural adjustments extend beyond directly affected firms into other sectors of the economy. Lawrence and Moran (2016), using somewhat different methods, estimate a range of 23,800 to 169,000 jobs. These numbers increase the ongoing flow of employment changes in the US labour market, or job churn. Given 55.5 million job changes in 2014, a typical number for non-recession years, mid-point estimates of the effects of the TPP would increase job churn by less than 0.1%. Based on worker experiences following layoffs (e.g. Reed 2013), Lawrence and Moran (2016) estimate the cost of employment dislocations due to TPP at 1.4 years of the salaries of affected workers, representing both periods of unemployment and lower wages in new jobs as job-specific human capital is sacrificed. Using this estimate and the national gains derived in our study, they calculate benefit-cost ratios for TPP ranging from about 3:1 to 20:1 (depending on the displacement scenario used) during the agreement’s most intense implementation period. The ratio rises to 100:1 over the full 2015-2030 projection period. However, US experience with adjustment assistance has been spotty, and better policies are needed to improve the fairness and flexibility of labour market outcomes given accelerating change in technology and globalisation. An important class of such policies involves wage insurance (Brainard et. al. 2005). As already noted, our modelling incorporates new trade theoretic features such as productivity gains associated with scale economies, shifts in output toward more productive firms, and gains from access to wider varieties of products. Thus, factor return results are not restricted to the famous Stolper-Samuelson prediction that more trade leads to lower wages in countries like the US. Rather, as TPP increases productivity, it raises returns for all three factors (skilled labour by 0.63%, capital by 0.39%, and unskilled labour by 0.37%). In the US skilled wages make up 60% of labour income and wages overall increase relative to capital returns. Lawrence and Moran (2016) trace the effects of changes in factor returns and product prices to household quintiles in order to examine changes in the US income distribution. They find that households in all quintiles benefit from TPP by similar percentages, but the middle three quintiles benefit slightly more than the lowest and highest quintiles. On the expenditure side, low-income households spend more on TPP-imported products than high-income households (the lowest quintile spends 8% more than the top quintile). Overall, they conclude that TPP will have a marginally positive effect on the US income distribution. Fostering growth and reducing poverty in developing countries through market-oriented reforms has been a long-standing global priority for the US and other developed countries. Nowhere has this policy approach been more successful than in the Asia-Pacific, with results that have lifted more than a billion people from poverty. Curiously, however, the role of the TPP in sustaining integration has received virtually no attention in the US, even from some prominent international and development economists. Their commentary, fuelling the criticism of the TPP, has focused almost entirely on current US interests. This is short-sighted, even from a strictly US perspective. Our results suggest that the agreement will strongly benefit its poorest members, including Vietnam, with income gains of 8.1% of GDP, Malaysia with 7.6%, and Peru with 2.6%. (Effects on non-members, which are negative in some cases, are small compared to these gains.) Several economies also see TPP as a tool for strengthening internal reforms. 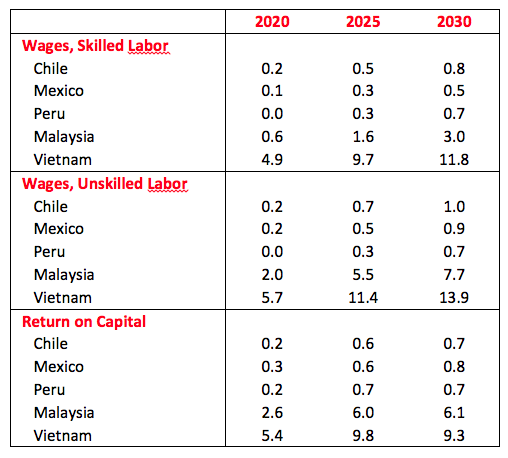 In addition, as Table 1 shows, in all of TPP’s developing economies unskilled labour would gain the most among all factors of production. In Vietnam, for example, 93% of garment and textile production is semi-skilled- or unskilled-labour intensive, and 52% of unskilled workers are female (see Plummer et al. 2014 and the 2010 National Labour Market Survey of Vietnam). The expansion of such sectors is particularly advantageous in reducing poverty. The labour chapter of TPP represents the state of the art in free trade agreements between developed and developing economies. The agreement commits parties to the ILO Declaration on Fundamental Principles of Rights at Work, guaranteeing freedom of association, the right to collective bargaining, and the prohibition of forced labour, child labour, and discrimination. The labour provisions are actionable and their implementation is spelled out in side letters between the US and Vietnam, Malaysia and Brunei, respectively. Such provisions are understandably controversial in developing countries, but they will benefit workers in the long run and, most importantly, enable trade relations to deepen despite rising expectations for labour standards in developed markets. As are all modern trade agreements, TPP is controversial. But recent opposition in the US has grown especially strong, with concerns focused on the economic effects of TPP on vulnerable groups. Our analysis is reassuring in this regard. The gains from TPP appear to be fairly distributed—labour will gain relative to capital, and cost reductions will favour low-income households. Some workers will need to change jobs, but they constitute a small fraction of normal job churn in any given year, and the national benefits argue for generous compensation for their adjustment costs. The agreement will also benefit workers in TPP’s poorest member countries. Still, the distribution of gains and losses will be unequal, as is often the case for efficiency-enhancing policies and innovations. This is not an argument against TPP—the ratio of benefits to costs is highly favourable—but underscores the need to manage it. TPP crystallises a central challenge of contemporary economic life; various current labour market outcomes are unfair and, absent more effective policy responses, undermine support for economic integration even in traditionally market-oriented economies like the US. Autor, DH, D Dorn, and GH Hanson. 2014. “The China Syndrome: Local Labor Market Effects of Import Competition in the United States.” American Economic Review..
Baker, Dean. 2016. "Peterson Institute Study Shows TPP Will Lead to $357 Billion Increase in Annual Imports". Medium. Retrieved from https://medium.com/ . Brainard, Lael, Robert E. Litan, and Nicholas Warren. 2005. "Insuring America’s Workers in the New Era of Off-shoring". Brookings Policy Brief no. 143. Washington: Brookings Institution. European Commission. 2012. 20 Years of the European Single Market. Brussels: European Commission. Krugman, Paul R. 1993. "What Do Undergrads Need to Know About Trade?" American Economic Review 2 (May): 23–26. Lawrence, Robert Z., and Tyler Moran. 2016. "Adjustment and Income Distribution Impacts of the Trans-Pacific Partnership", PIIE Working Paper 16-5, March. Petri, Peter A., Michael G. Plummer and Fan Zhai. 2012. The Trans-Pacific Partnership and Asia-Pacific Integration: A Quantitative Assessment. Washington, DC, DC: Peterson Institute for International Economics. Plummer, Michael G., Peter A. Petri and Fan Zhai. 2014. "Assessing the Effects of ASEAN Economic Integration on Labor Markets", ILO Asia-Pacific Working Paper Series, September, pp. 1-54. Walker, W. Reed. 2013. "The Transitional Costs of Sectoral Reallocation: Evidence from the Clean Air Act and the Workforce". Quarterly Journal of Economics 128, no. 4: 1787–835. Zhai, Fan. 2008. “Armington Meets Melitz: Introducing Firm Heterogeneity in a Global CGE Model of Trade.” Journal of Economic Integration 23 (3): 575–604. See Petri et al. (2012) and most recently Petri and Plummer (2016). The model was developed by Zhai (2008) and is based in part on GTAP data. Additional information is available on www.asiapacifictrade.org. The simulations assume that 20% of non-tariff barrier reductions are on a non-preferential basis, as in several studies of by the European Commission (2012), often with a higher spillover factor. The rationale is that some agreement provisions—for example, intellectual-property protection, regulatory transparency, trade facilitation—cannot be restricted to members alone.